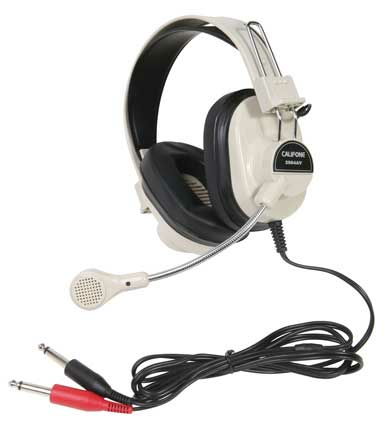 The 2964AV monaural, beige-colored headset is purpose-built for use with the CAR2020 CardMaster™ card reader by students who're engaged in literacy, ELL/ELD, special education, speech therapy and language learning applications. Its flexible, gooseneck with omnidirectional dynamic microphone with built-in wind screen captures vocal responses of even the softest speaker and reduces the recording of unintended sounds. It features over-the-ear, ambient noise-reducing earcups that allow students to focus on the lesson at hand. The earcups are constructed with rugged ABS plastic and have slotted baffles to prevent perforation of the internal speakers. The adjustable headstrap is made with PVC plastic for durability during prolonged use in classroom, library and language lab settings. The headset has dual nickel-plated ¼” plugs, recessed wiring, a 6' permanently attached straight cord, and replaceable, washable leatherette earpads. Two ¼'' plugs ABS plastic ear cups with adjustable comfort-fit headband Replaceable over-the-ear fitting leatherette cushions Around-ear ambient noise-reducing earcups deliver maximum protection against exterior sounds (without added electronic circuitry and expense). This reduces the need to increase the volume (protecting the ears) and helps keep students on task.